After a devastating fire last March, it was great news to hear that Chez Panisse has once again opened its doors. I spent a few weeks interning there one summer and I will never forget it. That experience - seeing the most beautiful fruit in the world and broadening my understanding of how a well-tuned professional kitchen hums - had a tremendous influence not only on how I think about pastries and desserts but how I think about food and hospitality. There are a great many people who have passed through their doors - diners, staff, interns and volunteers alike – who have shared this rare experience. And, luckily for us, that tradition will continue now with a whole new fresh start. If you value simple, wholesome and delicious food that originates from small local farms, you won’t find a better example of a great meal. So it’s wonderful news to hear they are back in business. I also got some great news this week so I wanted to join in on the excitement. One pastry that always reminds me of Chez Panisse is a fresh fruit galette. They make them every day and no matter the fruit, they are superb. 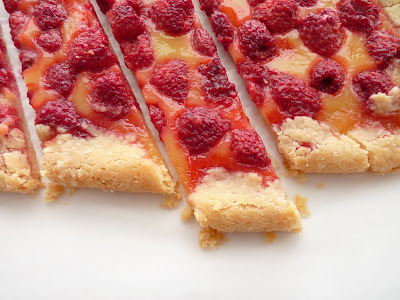 The pastry is always buttery and flaky, the fruit flavorful and glistening. For me, making a galette celebrates their return to serving amazing meals in a beautiful setting. 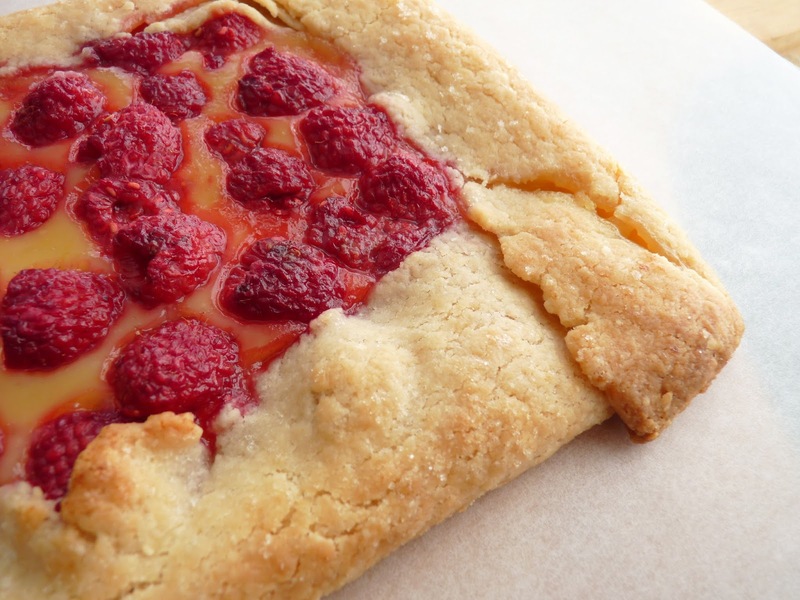 This is a fresh raspberry pastry that includes a layer of lemon curd. That’s not something you’d see at Chez Panisse but I love the combination of these two elements so I threw them together just for fun. The flavor is bright and tart and it's a good little pastry for celebrating new beginnings. 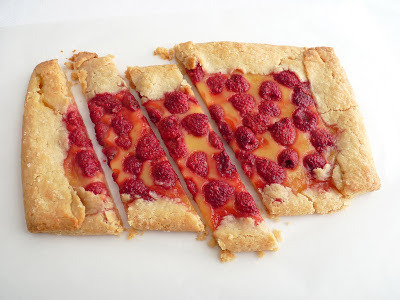 - Use very cold butter and water to produce a flaky pastry. - I like lemon curd that is tart. Add more sugar if you prefer a sweeter taste! - Modulate the amount of lemon curd and ratio of raspberries you use in the galette according to your own personal taste. Leftover curd can be refrigerated and served with biscuits or scones or stirred into vanilla ice cream. - Galette dough and/or lemon curd can be made 1 – 2 days ahead and stored in the refrigerator. - One thing Chez Panisse had on their menu this past week is Royal Blenheim Apricot Soufflé with Noyau Crème Anglaise, which sounds like heaven to me. I hope I can find some apricots this weekend so I can play with this idea. Maybe roasted apricots with a very light noyau cream. 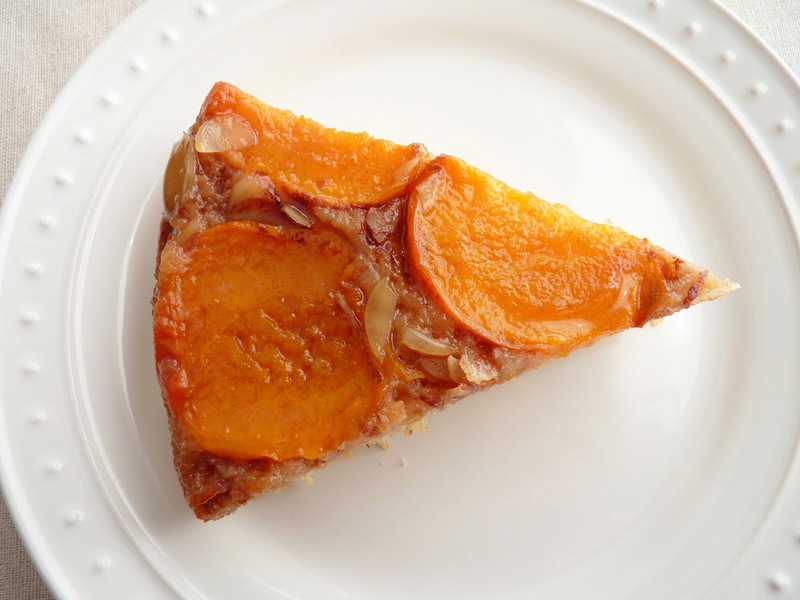 Mmmmmm…..
- Another seasonal galette is Peach Pecan Galette. For the pastry dough, place the flour, sugar and salt in the bowl of a food processor and process to combine. Cut the cold butter into 1/2” pieces, add to the flour mixture and process for 5 seconds. Add the water and pulse about 15 times. The dough will look a bit lumpy like cottage cheese. Gather the dough and place on a piece of plastic wrap. Shape into a flattened rectangle and wrap. Chill the dough at least 30 minutes or overnight. For the lemon curd, whisk the lemon juice, zest, sugar and eggs in a nonreactive heatproof bowl. Place the bowl over a pan of low simmering water, making sure the bottom of the bowl is not touching the water. Whisk and cook until the mixture begins to thicken, about 3 – 5 minutes. Pour through a strainer into a bowl. Cut the butter into small pieces and add, stirring to fully incorporate. Press a piece of plastic wrap into the surface and set aside to cool. When you’re ready to roll out the dough, remove it from the refrigerator and rest it on a lightly floured piece of parchment paper for a few minutes so it can soften just a bit to prevent cracking. Then roll the dough out to about an 11 1/2” x 8 1/2” rectangle (or other desired shape) and 1/8” thickness, gently lifting and moving the dough after each roll and keeping the parchment lightly floured as needed. 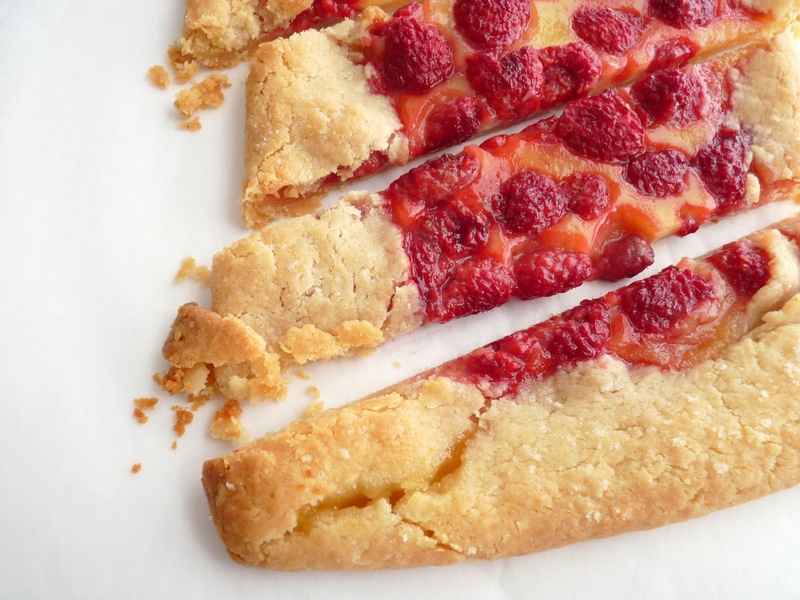 Brush off any excess flour and lift the parchment and pastry onto a baking sheet. Chill while you organize the remaining ingredients. Toss the raspberries and sugar together in a bowl. Spread a layer of lemon curd to within 1 1/4” of the border on all sides. Use about 1/2 - 3/4 of the curd, per your own personal preference, and store the remaining in an airtight container in the refrigerator. 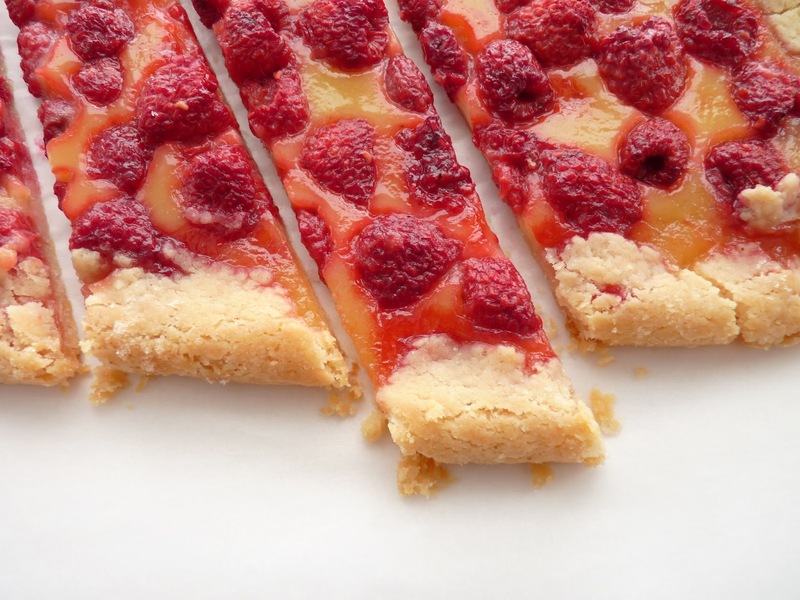 Distribute the sweetened raspberries evenly on top of the lemon curd. Fold the pastry dough over the fruit to form a border. Brush the border with melted butter and dust with a light sprinkle of sugar. Chill until oven is ready. Bake until the dough is crisp and browned, about 35 - 40 minutes. Cool on a wire rack. Seriously, is there anything quite like the sumptuous combination of fresh strawberries and cream? 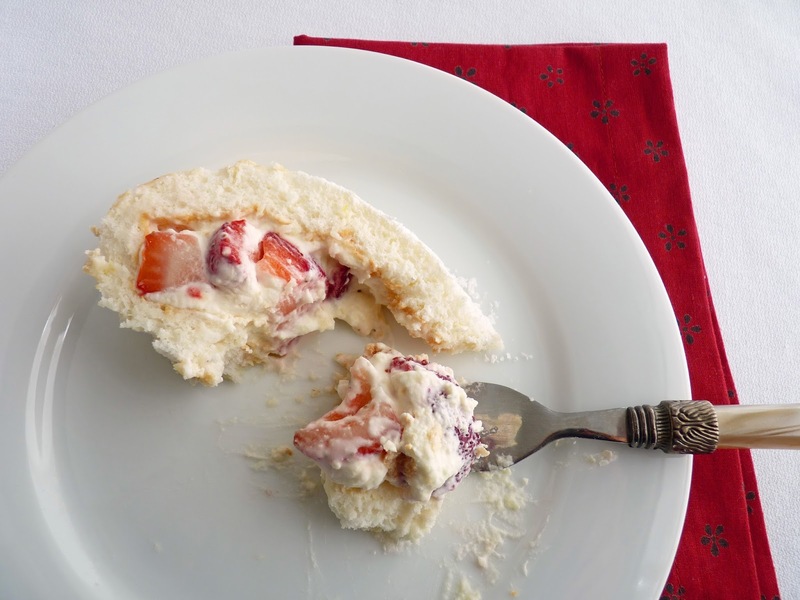 Whether you’re enjoying strawberry shortcake or vanilla ice cream with a strawberry compote or cheesecake with strawberry topping, it’s an incredibly delicious must-have summer indulgence. Angel food cake is a 19th century invention, then followed by Devil’s Food Cake in the 20th. I’m not sure why it’s called Angel Food. Perhaps because the beautiful batter resembles the gorgeousness of soft billowy clouds? 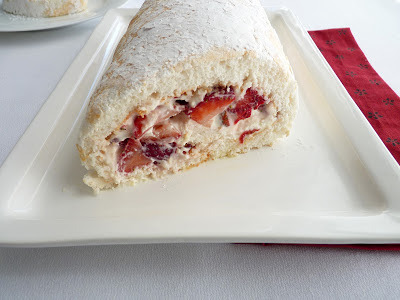 Since summer is upon us and strawberries are in great supply, I thought it would be fun to make an angel food cake rolled up and filled with sweetened strawberries and vanilla-scented whipped cream. The cake is a thin layer that stays moist, light and airy. 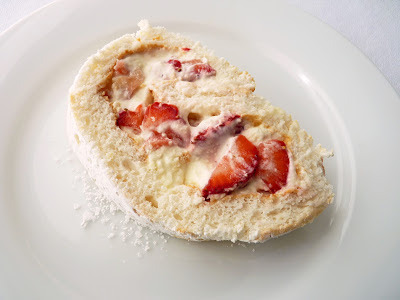 It’s filled with a simple cream and a layer of sliced fresh strawberries sweetened with a just a bit of sugar. So there’s cake, luscious cream and tart fruit combined in every lovely bite. Without a doubt, this is one of the quintessential American desserts of the season. If you happen to have a stash of egg whites from making a big batch of ice cream or custard, this cake would be a perfect way to employ them. And although I think strawberries are perfect, the cake is amenable to a variety of other fillings and flavorings that would be terrific: any sort of berry, peaches or nectarines with rum flavored cream, lemon curd and whipped cream, apricot honey compote folded into whipped cream……you get the picture. Here’s to the long lazy days of summer filled with delicious fresh fruit! - Cake flour with its lower gluten content makes a softer cake and lessens the possibility of cracking as the cake gets rolled. - Since the egg whites provide the leavening, they need to be at room temperature to achieve their fullest volume. Place the egg whites in your mixer bowl and set them out for at least an hour before you begin. - For the best loft, beat the egg whites slowly on medium speed until foamy. Than add the cream of tartar and continue on medium high until opaque. Next, slowly add the granulated sugar just a couple of tablespoons at a time. Beat just until the egg whites fall in a soft, droopy peak that holds its shape – not stiff peaks but not too soft. 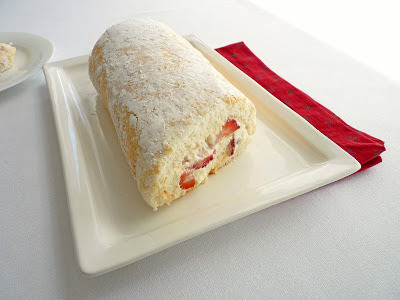 - I don’t bother with rolling the warm cake in a towel but go ahead and do that if you feel more comfortable with that method. I simple lay a towel over the cake when it comes out of the oven to retain some moisture, lifting the towel at the center to tent it a bit so it doesn’t get too soggy. I let it cool for about 25 – 30 minutes and then remove it from the pan. - Toss the strawberries with sugar just before you’re ready to assemble the dessert. You’re just trying to sweeten not macerate them. - If you have a good quality kirsch, try that instead of vanilla in the whipped cream. - Sweetened crème fraiche would make a great substitution for the whipped cream. Preheat oven to 350 degrees. Lightly grease an 18” x 13” baking sheet and line with parchment paper. Grease the parchment very lightly. Sift the cake flour, powdered sugar and salt and set aside. Beat the egg whites on medium speed until foamy. Add the cream of tartar and beat until opaque. Turn up the speed to medium high and gradually add sugar just a couple of tablespoons at a time. Beat until soft peaks form that droop but hold their shape when lifted. Add vanilla and lemon zest during the last minute of beating. Fold in the flour mixture, one-third at a time, just until there are no streaks of flour. Spread the batter in the prepared pan. Bake until the cake is browned and springs back when lightly touched, 14 - 15 minutes. Place the pan on a wire rack to cool. Run a knife around the edges to loosen. Tent a towel or foil over the cake so it retains some moisture. Cool for about 25 – 30 minutes. Whip the cream with the sugar and vanilla just until soft peaks form. Chill. To assemble, dust the top of the cake with a good coating of powdered sugar. Place a piece of parchment or a towel on top and invert the cake. Gently peel off the parchment from the bottom of the cake. Slice the strawberries and sprinkle with 1 – 2 tablespoons of sugar, to taste. Spread the whipped cream over the surface of the cake to within 1/2” of all sides. Layer the sliced strawberries evenly on top of the cream. Starting at the long end, gently roll up the cake using the parchment to assist. Trim the edges and place seam side down on a serving plate. Dust with more powdered sugar, if needed. Chill until ready to serve. It’s impossible to even imagine late spring or early summer without cherries. As soon as they start appearing piled high at the market or roadside stand, they call for immediate devouring. And every now and then, we glance at the pile of pits and stems in amazement that we were able to consume so many so quickly. But our red-stained fingertips are a sure clue. I’m a big fan of bar cookies with fruit filling, which are really in many ways more like luscious little bites of a fruit tart. 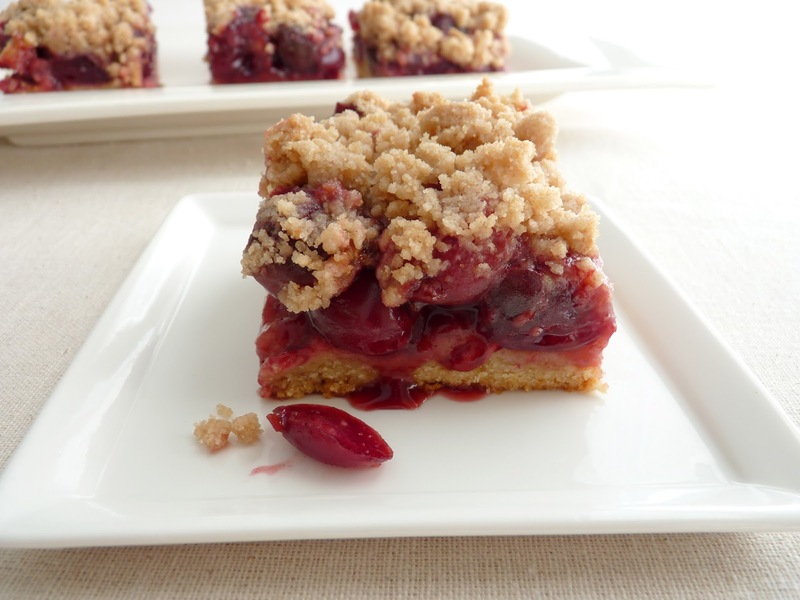 There’s a bottom crust, a gooey fruit layer and then some sort of crumble mixture on top. There’s no rolling of crust or scooping of cookie dough or much of any fuss or muss, so they’re relatively easy to prepare. And they are invariably chewy and delicious morsels. 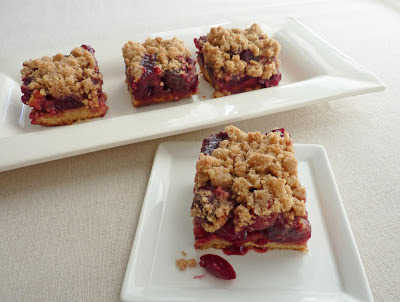 These Cherry Crumb Bars are chubby little things. There’s a thick layer of bottom crust because I like the texture contrast with the fruit in the same way that I love pie crust. The cherries this season are very sweet and juicy and beautiful, so I really wanted to test them in this format. 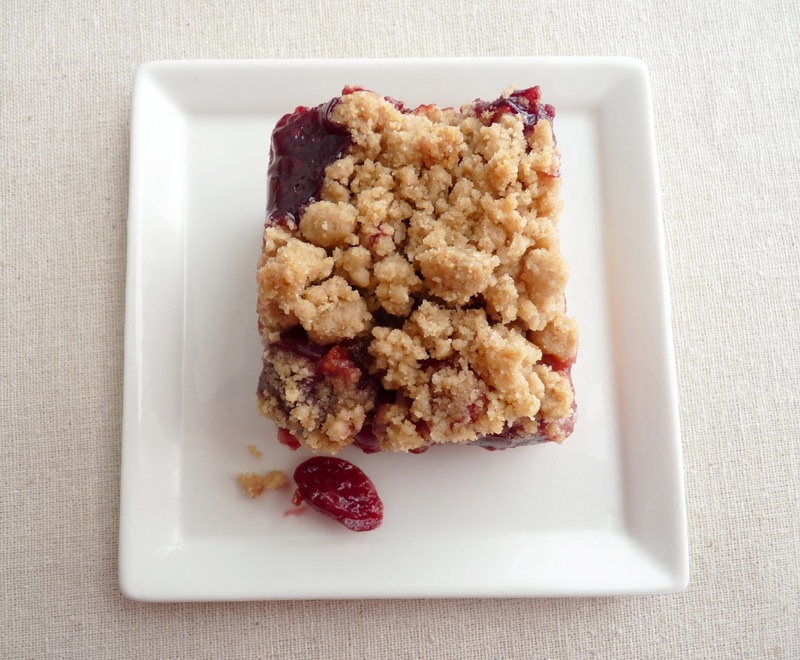 And if you’ve ever had a piece of New York style Crumb Cake, you know how crazy delicious lots of buttery baked crumbs can be on top of anything. 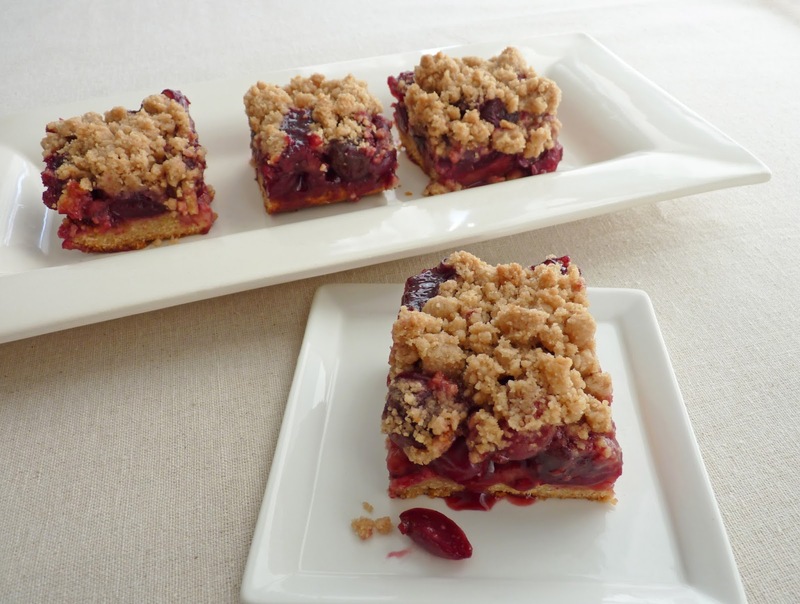 If you love cherry pies or cherry shortcakes, you will probably love these bars. They’re full of fruit and flavor. 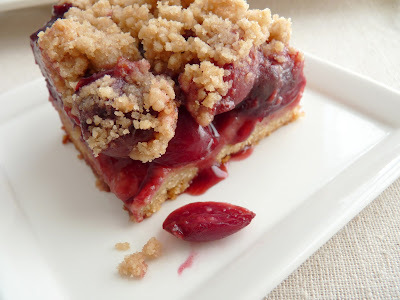 The aromatic spice in the cherries and the salt in the dough and crumb topping pique our taste buds and remind us once again of all the goodness of June and July. Cherries!! - I happen to really like cherries with cinnamon and star anise but leave them out if you wish or subtitute your own favorite flavoring. - The bars will be easier to cut once they are completely cool and the filling has a chance to firm up. I use a serrated knife. - I left the pitted cherries whole but chop them just a bit if you’d like the bars to slice more neatly. Preheat oven to 350ºF. Lightly grease an 8” square pan and line with a piece of parchment paper large enough to form an overhang along two sides of the pan. Place the pitted cherries and sugar in a saucepan. Combine the cold water and cornstarch and add to the cherries. Add cinnamon and star anise and simmer on low heat, stirring occasionally, until the juices thicken, about 10 minutes. Take off the heat, remove star anise and add lemon juice and vanilla. Set aside to cool. For the crumb topping, combine the flour, both sugars and salt in a bowl. Melt the butter and add. Use a fork to stir until the mixture clumps and holds together when pressed. Using your fingers, pinch the mixture to form bits and pieces. Chill until ready to use. For the bottom crust, combine the flour, both sugars, baking powder, salt and lemon zest in the bowl of a food processor. Process until ingredients are combined. Cut the cold butter into 1/2” pieces and add to the dry ingredients. Process until it looks like coarse meal. Combine the egg yolk, milk and vanilla and add. Process just until the mixture starts to clump and holds together when pinched. Press the dough clumps into the prepared pan to form an even bottom layer. Bake until puffed up and the surface looks dry and slightly browned, about 15 minutes. Pour the simmered cherries on top and spread to within a 1/4” of the edges. Top with the crumb mixture, making sure to distribute to the edges and the corners to form a border. 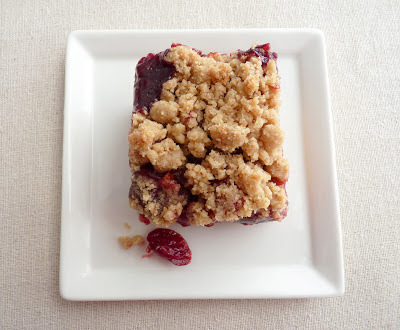 Bake until the fruit is bubbling vigorously and the crumb topping is lightly browned, about 25 minutes. Place the pan on a wire rack to cool completely. Run a thin knife around the edges and gently lift out of the pan using the parchment overhang to assist. Cut into bars. So now we’ve come around once again to my favorite part of the fresh fruit season. Apricots and cherries have arrived and there’s the scent of peaches sure to follow. And sometime soon we may be able to enjoy the heavenly vision of figs! We are in the zone. Apricots are looking very good right now. My first purchase was for the pure pleasure of eating them plain and simple. Wow, are they deliciously tart and sweet. My second batch made it into this very simple upside down cake. And, of course, there will be a third and a fourth batch, etc., etc. Rather than the usual brown sugar and butter coating (which, by the way, is very delicious), I decided to float the apricot halves with their best buddies, honey scented with vanilla and cinnamon. 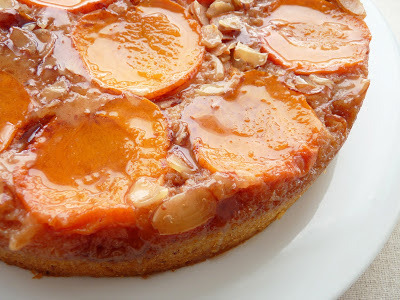 The cake is also enhanced with toasted almonds to give it only a very slight hint of texture and the flavor that goes so well with so many of the stone fruits of the season. This would be a good dessert with a dollop of almond flavored whipped cream or served simply as a brunch cake on a sleepy weekend morning. 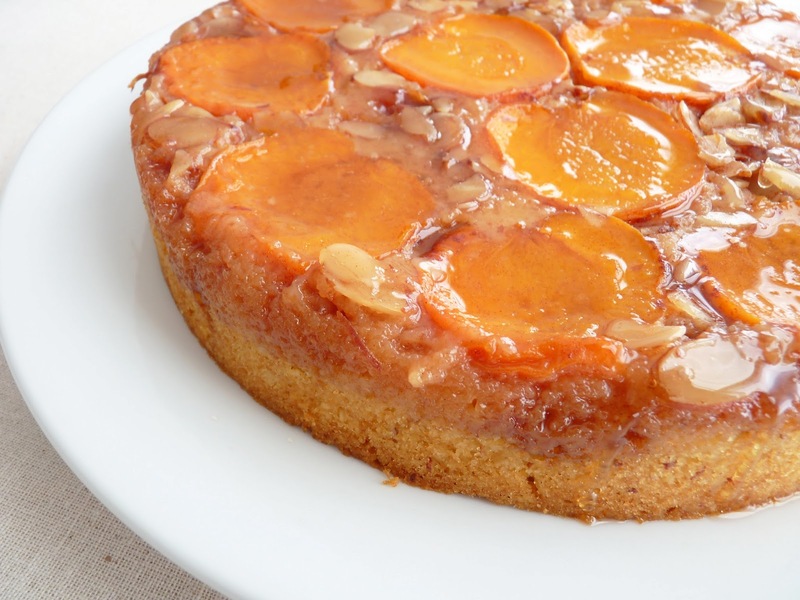 Apricots are notorious for keeping their beautiful visit short and sweet. Get yourselves to the market and behold the best that nature has to offer! - I like to use sliced almonds rather than whole ones for this kind of cake because they grind with the flour to a finer crumb. - Toast the sliced almonds in a single layer in a 350 degree oven for about 6 - 8 minutes. Watch them closely as they will burn very, very quickly. 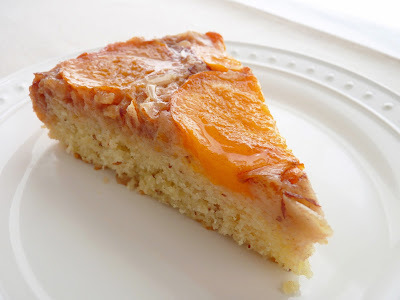 - I use 3 tablespoons of honey for the topping as the cake bakes. After the cake is baked and has been turned out of the pan, I use another 2 tablespoons of honey to glaze the top of the cake. If I used all 5 tablespoons for the bottom of the pan, the cake would be pretty soggy. Apricots become even more tart once baked so the cake does need the extra 2 tablespoons of honey glaze. - Lining the bottom of the cake pan with parchment helps ensure your cake will turn out with the topping in tact. - If you’re an apricot fan, try Cornmeal Cake with Apricots or Olive Oil Sponge Cake with Apricots. Preheat oven to 350 degrees. Lightly grease a 9” x 2 1/2” cake pan and line the bottom with a circle of parchment. For the cake topping, place the 3 tablespoons of honey, butter and cinnamon in a saucepan and heat until melted, whisking to combine. Take off the heat and add 1/2 teaspoon vanilla. Pour into the bottom of the cake pan, then lift the pan and swirl to distribute evenly. Slice the apricots in half and place cut side down on top of the honey butter mixture. Fill in the gaps with a sprinkle of toasted sliced almonds. For the cake batter, place the flour, 1/2 cup toasted sliced almonds, baking powder and salt in the bowl of a food processor. Process until the almonds are finely ground. Pour into a bowl and set aside. Cream butter and sugar until light and fluffy, about 4 minutes, scraping down the sides of the bowl as needed. Add vanilla and almond extracts and blend. Beat in eggs one at a time, scraping down the bowl and mixing thoroughly after each addition. Add a third of the flour mixture alternately with half the milk, beginning and ending with the flour. Spread the batter evenly over apricots. Bake until a toothpick tests clean, about 42 – 45 minutes. Place on a wire rack to cool for 15 minutes. Run a thin knife around the edge of the pan to loosen the cake. Invert the cake carefully and remove the parchment. Warm 2 tablespoons honey and brush on the surface of the cake to glaze and sweeten. Cool completely.